turned type? minim misreading? confused case? ”U’ shouldn’t be here!’ I exclaimed. We have a mystery. I’m not sure how this could happen to a book published in 1994, but it did. Instead of reading ‘gentrified’, I stumbled upon this strange word ‘geutrified’ in the middle of a long chapter on the dramatic life of Robin Hood in the theatre of the 1590s. The book is a groundbreaking, comprehensive study of the history, use, transmission, and appropriation of Robin Hood, written by Stephen Knight, called Robin Hood: A Complete Study of the English Outlaw which you should read if you have any interest in the man, or the myth, or the myth of the man. It changed the field of Robin Hood studies decisively and for the better, and I’m enjoying it thoroughly as part of my research on genre. And yet I’m investigating this one tiny error because the type of error (no pun intended) is also germane to my research. Minnie Minim Misreading: This has the compositor setting directly from manuscript, where the ‘n’ looks like a ‘u’ based on unclear placement of the lines connecting the minims (i.e. the vertical strokes). I think we can safely excuse #2 from the line-up, as I’m sure the printers at Graphicraft Typesetters Ltd. in Hong Kong weren’t setting the book from Professor Knight’s manuscript papers. If the book was set from MS (fair or foul copy), this would remain a valid palaeographic line of inquiry – my own handwriting, for example, often leaves one wondering if I meant ‘u’ or ‘n’. Before we put out an APB for ol’ Tommy, totally disregarding the impossibility of current practice and pretending it’s actually 500 years ago, we have an visual clue to excuse him: serifs. 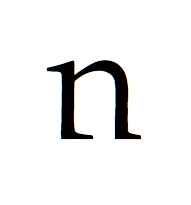 The quality of image above allows us to compare the serifs on the ‘u’ in ‘geutrified’ with the serifs on the ‘n’ in ‘stronger’ on the preceding line. 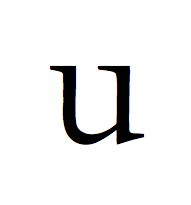 Not only does the ‘u’ appear to have a larger distance between minims but all three of its serifs differ from those on the ‘n’ above it. I can’t zoom in much further, so it’s handy that the copyright page tells me the book was set in 13 pt. Garamond, and I can give you some detailed images of that. Take a look at these faces and let me know when you see someone familiar. If this were actually a mystery of moveable type, we would have found an example of foul case, where a ‘u’ filed in the ‘n’ compartment managed to find its way onto the stick. 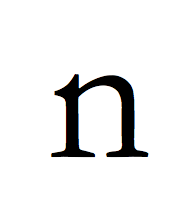 But it’s a double error, because if it were simply foul case, we would just have an unusual looking ‘n’, one that has the serifs of a ‘u’ but faces the same way as nos 1 and 4. The secondary error comes from the ‘u’ being placed upside down. 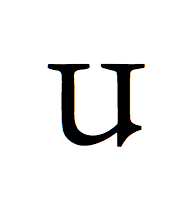 It’s complicated to write, but basically, if a compositor grabs a ‘u’, thinking it’s an ‘n’, he’d rotate the piece 180° and the resulting printed image would look like #4. In the case of ‘gentrified’, the ‘u’ was set as if the word needed a ‘u’, but unless misread from the source, this is an error of turning the letter 360°, which is why it looks like #3. Unfortunately, none of these things answer how this happened in a book ostensibly set digitally. My realm of knowledge fails after 1642. If yours doesn’t, write me a comment. I’ll be eating a donut.